There was recently an interesting discussion on Twitter about the emphasis many battlefield tours place on visiting First World War cemeteries and memorials, and whether this can provide a rounded and well-balanced view of events one hundred years ago or if tour groups get ‘cemetery fatigue’. Telling the stories of those who died has always been a key focus for me, helping to create the link between the events and the people, and the part they played. However, when visiting the battlefields one can become overwhelmed by the sheer amount of headstones and names. Each one only contains basic information, and wandering through the neatly manicured rows of the Commonwealth War Graves Commission cemeteries it can often be difficult to ‘feel’ anything when little is known about the burials and the context in which they lost their lives. This book attempts to provide a remedy to this. The result of what must have been a considerable amount of research, it provides details and vignettes about some of those buried in the cemeteries. 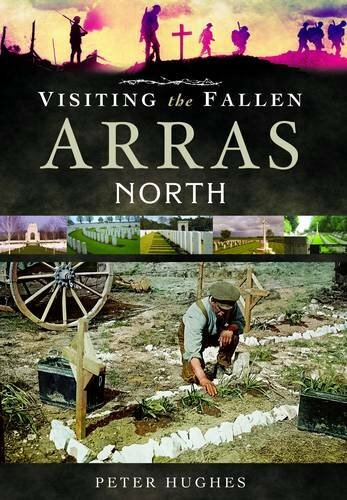 This first volume focuses on the Arras north sector, with a further volume for Arras south and one focusing solely on the memorials in the area. The choice of area is interesting; Arras was in the front line for much of the war and saw heavy fighting in 1917 in particular, but far less has been written about it than the Ypres or the Somme. A book (or books) covering these areas may have proved more popular, but I for one am glad that Peter Hughes chose to focus on a more neglected area. Very little contextual information about Arras and the battles that were fought in the vicinity is provided as an introduction. Instead, the book launches straight into accounts of the cemeteries and those buried within. However details about each cemetery give some indication as to its significance to the events that took place. However what I enjoyed about the book was the amount of information I picked up whilst reading it, particularly about the campaign of 1917. The stories of the burials vary widely in content and length. Whilst including some perhaps more well-known individuals, a wide variety of men from different backgrounds and ranks are represented, although there is (perhaps naturally, given the records available) a high proportion of officers and gallantry award winners included. As can be expected the research has been very thorough with war diaries, battalion and regimental histories consulted alongside lesser known volumes and records. This might not be a book that you read from cover to cover, but is certainly one you can dip in and out of, particularly if you are visiting the cemeteries. As a book that you are likely to want to refer to on the battlefield, a smaller paperback version would have perhaps been preferable. However, this is a minor quibble and, with 59 cemeteries featured in the book, I think the author should be commended for the effort and research he has put in to producing this volume.